While in California last month I had the opportunity to stay at the Los Angeles Biltmore in downtown LA. HOLY COW! That place is a piece of art. 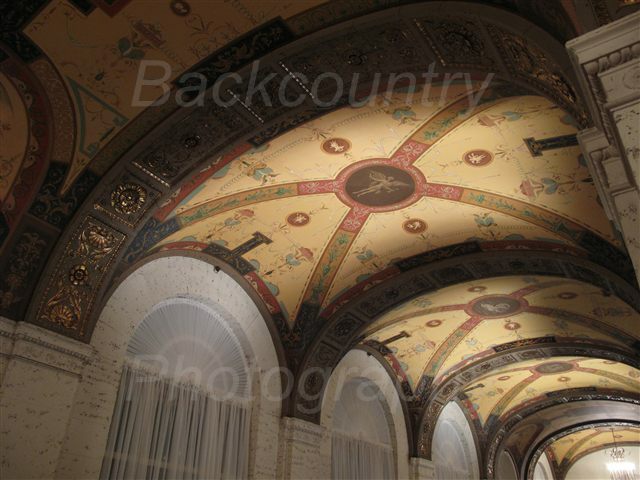 Every step you take there is a new archway, mural, filigree, column, chandelier, passageway. Marble tile flooring. Stunning paintings. Detailed ceilings. Impressive woodwork. The building is just gorgeous. We walked in the lobby and I came to a screeching halt. A little chain reaction formed. My sister bumped into me. "Bubba, the front desk is a little further." My niece, ever so graceful, side-stepped both of us. The bellman thankfully was lagging a bit behind and managed to bring the luggage trolley to a stop just before clipping any heels. "I have to get my camera out." I whispered as I turned to accost the bellman with our mountain of bags on the bowing trolley. "Can you please wait until we are checked in?" I wasn't sure if I picked up a hint of mortification at my gaping or exhaustion from the 11 hour travel day. I waffled between pressing forward and returning to get my camera bag before caving in and heading to the puzzled woman at the front desk. See this is what happens when I put my camera away. I was as antsy as a kid in line for a carnival ride, but I managed to wait until we and our luggage had been ushered to our room before grabbing my camera and heading right back our to explore.